Central Park Plaza has transformed a little-used parking lot into a vibrant community gathering space, adding vitality to Valparaiso, Indiana’s bustling downtown. Children engaging in exercise games at a fit city event. Photo courtesy Valpo Parks. Central Park Plaza occupies about 2.5 acres bordered by Lincolnway to the north, Napoleon Street to the west, Indiana Avenue to the south, and Washington Street to the east. 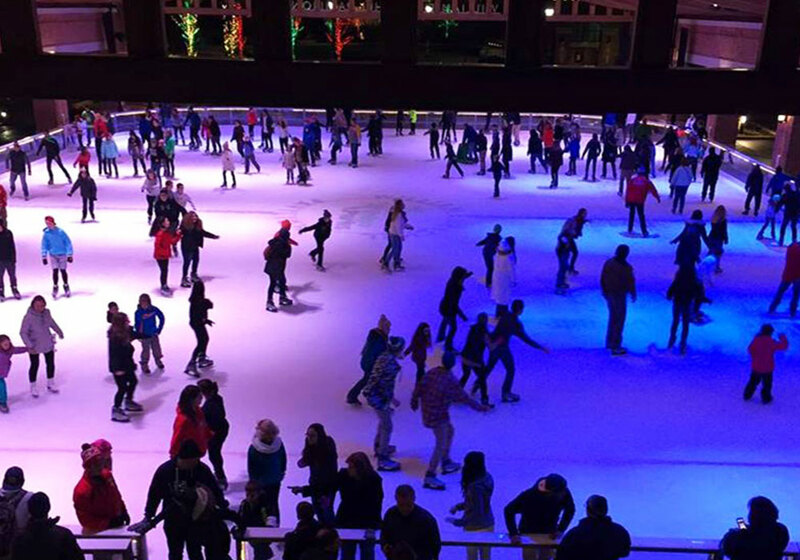 Central Park Plaza’s ice skating rink. Photo courtesy Valpo Parks. As Valparaiso’s downtown businesses began to thrive in the early 2000s, the city’s planners realized that a public space was the next thing the downtown needed. Valparaiso had a surplus of parking and unused space, but it lacked a true public gathering space and forum for performing arts. The city came up with a plan to demolish an underused parking lot and build a grand plaza featuring green space for picnics, an amphitheater, a splash pad for kids, and even a statue of Valparaiso’s most famous resident, Orville Redenbacher. After securing the funding — more than 50 corporate and individual partners donated almost $4 million in addition to a contribution from the city’s Redevelopment Commission — Central Park Plaza opened to great fanfare in the summer of 2011. 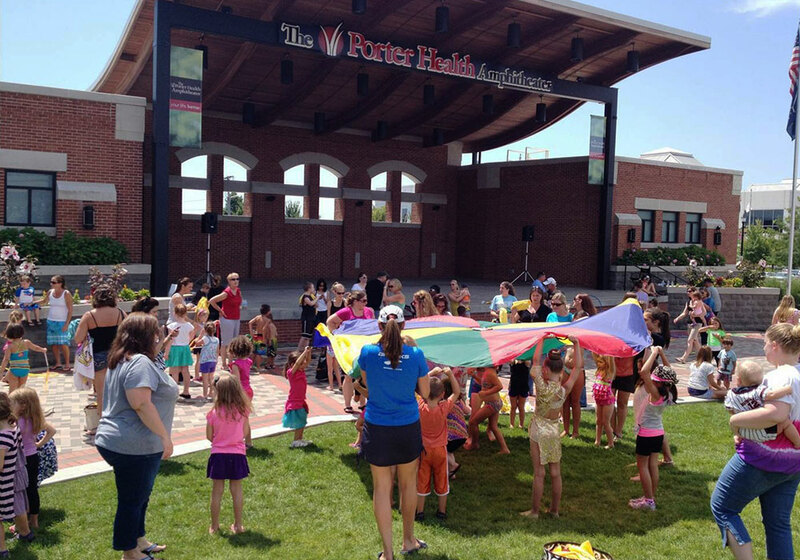 The park is designed to serve a wide variety of functions for its Northern Indiana community. The western half of the park is home to the 10,000 square foot, open air William E. Urschel Pavilion, which converts to a lighted ice rink for skating in winter complete with an excellent sound system and warming space with concessions. The eastern half of the park includes a large amphitheater, picnic spaces, and the splash pad water feature. The combination of features makes Central Park Plaza a perfect place to host a variety of events year-round, including beer and wine festivals, concerts, outdoor movies, farmers markets, hockey nights, public speakers, ice sculpture shows, fundraisers, weddings, and the annual Valparaiso Popcorn Festival. Since opening, Central Park Plaza has created an active space for the community, hosting an average of 200,000 visitors per year despite a city population of just 31,000. While aesthetically pleasing with architecture that reflects the historic downtown, the real beauty of this park comes from its flexibility and inclusiveness. Community involvement is strong, including private business investment. The local hospital and health provider was the major partner in creating the outdoor amphitheater, and a local manufacturing business contributed a substantial gift to make the multi-use pavilion a reality. The city's website includes a page for feedback and input on planning processes. The park itself serves as a central point for the public to engage with the planning process of not only the park, but the city as a whole. 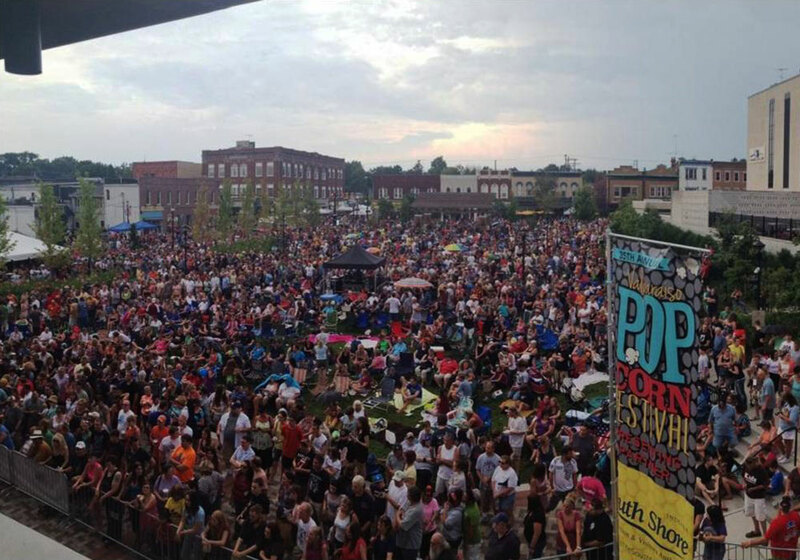 A large crowd enjoys a concert during Valpo’s Popcorn Festival. Photo courtesy Valpo Parks. The space is used throughout the day and evenings, offering free concerts, farmers' markets, fitness classes, and space to gather. Lighting along the streets matches the style of the town and ensures the area is safe to walk around at night. Lafayette Street, which separates the two halves of the park, has been designed to calm traffic and to allow for easy transition into a pedestrian-only street. There has been substantial development along Lafayette Street since the park came in, including new businesses and restaurants and recently renovated facades. The plaza is surrounded by government buildings and local businesses. There are transit stops within a couple of blocks and a connection to regional transit into Chicago via a park-and-ride two blocks west. Community programming includes a farmers' market, fitness events, concerts, sports events, outdoor movies, and festivals. Building on the park's success, two new planned districts will branch outward from it: an arts corridor along Indiana Avenue and a Transit-Oriented District to the south. The annual Valparaiso Popcorn Festival pops into Central Park Plaza in September with family-fun activities, two live music stages, and the nation’s first Popcorn Parade.